Less is more, but only with the best active ingredients. That is exactly what Jochem Hes and Sjoerd Trompetter thought when they became dads in 2013. A whole new world opened up to them but they also found out that even baby care products contain harmful ingredients. That can’t be a good idea. So Naïf was born: a reliable skincare brand for babies and children, without all the nonsense. Build on the believe that families should not have to worry about the ingredients in their personal care products. But, kids grow up… so a line was created for women. A complete skincare line with natural care products, without chemical clutter, that every woman needs in her daily beauty routine. Naïf makes great products that are kind for every body and nature. They do what they promise; they nourish, clean and let you shine. The products are 100% vegan and made from natural ingredients such as flaxseed oil, avocado oil and lycosol (tomato extract). They are packed in sugarcane bio-plastic tubes. The products do not contain mineral oils, chemical preservation or harsh chemicals and are free from microplastics. Naïf takes sustainability serious. Just like our skin, there’s no planet B and what you use in the shower or on your skin ends up down the drain. For example, many products still contain miciroplastics. 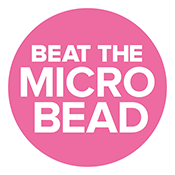 One scrub can contain over more than 100.000 particles microplastics (beat the Microbead). Naïf tends to do things differently and wants to change the world of cosmetics. For example with our latest innovation: world’s first circular beauty product! A circular face scrub, made with calcite granules extracted from Dutch tap water. We’ve joined forces with Dutch watercycle companies Waternet and Aquaminerals to transform calcite, a residue from purifying drinking water, into a high quality beauty product. We want to create the biggest impact in everything we do. Why? Because Naïf simply cares!